Gundersen Family Site: We're Having A Baby!!! Just to fill everyone in that doesn't already know, we are having a baby! We are both very excited! We are due April 26th and can hardly wait for the next 6 1/2 months to go by. We are so happy to have a spring baby just in time for summer and right after Tyson finishes school here at BYUI. We can't wait until our little one is here. Oh my gosh...I called that 3 weeks ago!!! I am telling ya..I am a baby predicter!! YEAH!!!!!!!!!!! WAHOO!!!!!!!!!YEAH!!!!!!! WAHOO!!!! !I AM SO EXCITED FOR YOU!!!! CONGRATULATIONS! How exciting!!! I'm so happy for you!! Pregnancy is such a fun, exciting time! Hope it is going well for you! YAY! Congratulations! I was wondering when you shrugged my question off at Green Canyon! Yaaaaay! So cool! Babys are to absolute cutest! Congratulations!!! 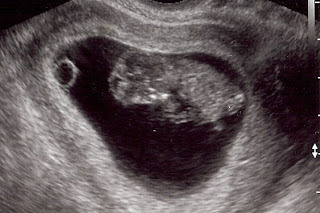 The ultra sound picture turned out great too.